In the early part of the 20th century, Soviet filmmaker Lev Kuleshov did a series of experimental movies to determine where viewers draw meaning from a series of images. In these short films, Kuleshov would show a person’s face followed by shots of various actions. His point was that no one shot or image has meaning on its own. Instead, meaning derives from the interaction and relationship between two sequential shots. Tetris Effect, the new puzzle game from Lumines director Tetsuya Mizuguchi, developer Resonair, and publisher Enhance, Inc., reveals something similar about video games. Out today (November 9) for PlayStation 4 and PlayStation VR, this falling-block puzzler maintains most of the rules and elements that Russian designer Alexey Pajitnov created for the groundbreaking original in 1984. Nearly a quarter of a century later, Tetris is evidence that it is difficult to improve upon perfection. And yet, Tetris Effect does exactly that. How does this game make Tetris better? By realizing that games are more than just mechanics. It makes Tetris better by uncovering the meaning between the mechanics, the player, the music, and the visuals. It is one of the best games I’ve ever played. Tetris Effect gets its name from the phenomenon where people who play a lot of the game begin seeing the pieces in the world around them and when they close their eyes. But I think that term will take on new meaning once more people get their hands on this version. In the Tetris Effect’s campaign mode, players go from one level to the next. You’re playing Tetris with a handful of minor tweaks and a couple major changes. But what separates one stage from the next is how they look and sound. And what’s incredible is that each stage ends up feeling different because of what you might consider “superficial” changes. Only you’ll quickly realize that they aren’t superficial at all. Because as the music changes and as the materials of the blocks change from fire to ice and as their sound effects shift from swooshes to clinks, you begin to play different. You are different. 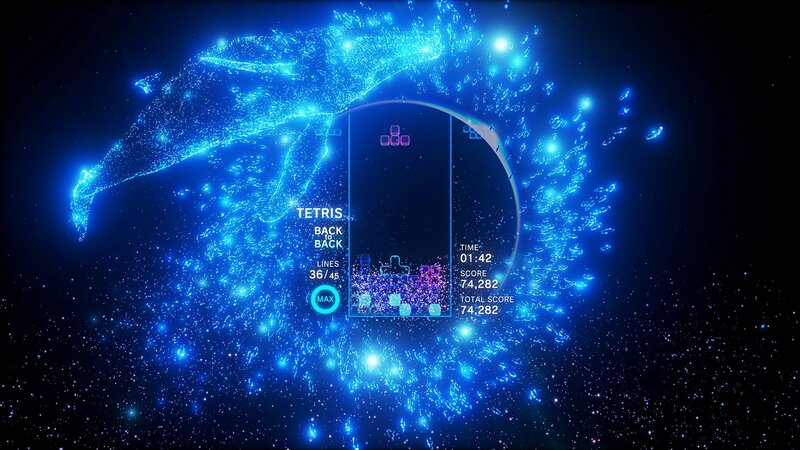 More than anything I’ve ever played, Tetris Effect reveals that games aren’t just mechanics. Animations and sound and lighting are just as important to creating a relationship to a player as “pure gameplay.” Because the mechanics in Tetris Effect never change. You don’t level up or unlock perks. You are just playing Tetris, and yet when everything around the mechanics change, it causes some chemical reaction in your brain that creates a change in you as a player. It’s almost like Mizuguchi is playing you. And it feels incredible to open yourself to that and to adapt to what the game wants from you. But this is not exactly pure Tetris. You get a new focus mechanic where you build up meter by clearing lines. And then you can spend that meter by clicking in the right trigger. This halts time. As you would expect, freezing the action gives you some latitude to figure out how to get out of a bind. But as you get more confident, you should begin to use it to stack lines all at once. When time is stopped, any line you clear drops to the bottom of the playfield, but it doesn’t count until you return to real-time play. This means that, for the first time in the history of Tetris, you can get more than a 4-line clear (also called a “Tetris”) at once. This does not change what Tetris is. Instead, like Pac-Man Championship Edition DX, which remixed the ideas of the arcade classic Pac-Man, Tetris Effect is improving the concept by amplifying and adding onto them. For novice Tetris players, it’s going to give you a way to feel more comfortable in the most hectic moments. For experts, it is something new to master. It also makes the entire game feel even more active without feeling like a gimmick. You are still playing Tetris, but you are progressing within the confines of its timeless design. This is what Tetris should be from now on. Tetris Effect could never replace the original, but it absolutely should live alongside it. I’m nitpicking. I don’t think this is going to be the best competitive Tetris or anything, but it’s not trying to be that, so I’m not going to hold it against this. But the developers are presenting it as a virtual reality game first even though you can play it in 2D on a television without issue. I’ve played it in both, and I think the VR mode can be underwhelming. I’m not even saying it’s a disappointment. It’s not. I often felt my jaw drop at the visual effects surrounding me during especially intense moments. But it’s not exactly the definitive experience that the developers claim. Some of the effects are just so-so in a few levels, and I was kinda hoping that it would maintain a high wow-factor throughout. I almost prefer the game on a TV and a surround sound system. One of the things that does maintain the wow-factor from beginning to end is the music and sound. The beats start out great and get better as they react to your actions and the bass drops as you reach a certain number of lines. Getting that music on a surround system that fills your room feels like a singular experience that the playing with headphones in VR does not. I’m actually going to try playing VR with surround sound. And maybe that is the ideal setup for this game. And maybe that is the actual knock against this game: It makes you think about how you’re playing it. Don’t. Do whatever is easiest for you and experience it for yourself. My only other concern is that it has too many modes. Once you finish the campaign, you can hop into the Effects Mode and choose from a lengthy list of game types. But it’s too much, and it makes me feel like I don’t know which one is the right one. I find that slightly discouraging. Thankfully, the developers already have weekend events to address this problem, but during the week I expect to feel overwhelmed. I hope they do events during the week as well. I just always want something to focus on instead of just aimlessly jumping from mode to mode. I consider myself lucky that I got to play this game. It’s special. If I could go back in time to show a video game to artists from the last century, I would choose this. God, I know that sounds hyperbolic, but I mean it. It is such an effortless and mesmerizing marriage of perfect game design and powerful imagery and audio. And it is an interactive lesson in why those things matter to games. I’m going to keep coming back to Tetris Effect for the rest of my life. Tetris Effect is out today for the PlayStation 4. Sony provided a downloadable copy to GamesBeat for the purpose of this review.